Growing up, Ryan Gross was always inspired hearing about his grandfathers’ World War II experiences, including leading tank units at the Battle of the Bulge and serving on a Navy destroyer in the Pacific. It was this connection that led him to become a military intelligence officer in the U.S. Army. These experiences instilled in Ryan the value of public service and the need for strategic thinking in the military. He transitioned from the Army to working for the Defense Intelligence Agency (DIA) after his deployment in Baghdad. For over a decade, Gross has led intelligence analysis for ambassadors, policymakers and commanding generals. Now, as a Syracuse University student veteran, Gross is representing the Orange as its first-ever Tillman Scholar. Syracuse University became an official Pat Tillman Foundation University Partner in 2016, joining 14 other universities across the country. The University was chosen for its commitment to providing support to student veterans and their spouses. The scholarship was named after Pat Tillman, a former NFL player for the Arizona Cardinals who left his professional football career to join the U.S. Army Rangers following the Sept. 11, 2001, attacks. The Pat Tillman Foundation was founded in 2004, following Tillman’s death while serving in Afghanistan. The foundation’s mission is to unite and empower remarkable military veterans and spouses as the next generation of public and private sector leaders committed to service beyond self. 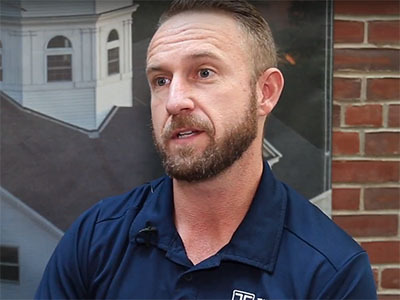 Listen to Ryan Gross describe his experience as a Tillman Scholar. Gross is a candidate for the master of public administration at the Maxwell School of Citizenship and Public Affairs. Gross added that his experience at Syracuse has been incredible. Tillman Scholars are chosen for outstanding academic performance and leadership potential. The Tillman Scholar fellowship program supports Tillman Scholars with academic scholarships, a national network and professional development opportunities so they are empowered to make an impact in the world. Scholarship money is used to assist with academic expenses, such as tuition and fees, living expenses and books. Applications for the 2018 Tillman Scholarship open Feb. 1 and close March 1 for active-duty service members, veterans and military spouses at Syracuse University. Applicants must provide documentation of their military service, or their spouse’s. Additionally, they must submit a resume, two essay responses and a third-party recommendation. To apply to be at Tillman Scholar, visit the Pat Tillman Foundation application site. Finalists will be chosen in April and will be interviewed by the Pat Tillman Foundation. For assistance with the application process, please contact Jolynn Parker, director of the Center for Fellowship & Scholarship Advising, at 315.443.2759.